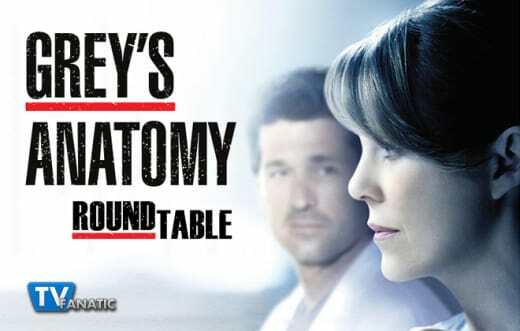 A mother lost two sons on Grey's Anatomy Season 11 Episode 18, just one of many topics Stacy Glanzman, Amanda Steinmetz, Mary Kate Venedam and Christina Tran have to discuss from an installment that also featured Omelia, Callie’s potential for a date and a whole lot more. What was your favorite quote or scene from Grey’s Anatomy Season 11 Episode 18? Stacy: I liked Alex showing the kids the scans. That was pretty funny. He’s so great with kids. Amanda: I really liked the scene with Derek and Amelia at the end. I was happy to hear Derek knows what he wants now. Mary Kate: I liked the end scene with Derek and Amelia. I have always loved their relationship, so I’m looking forward to seeing them together more (and hopefully getting along) now that Derek’s back. Christina: I’m with Mary Kate. I love sibling scenes! Did you find any part of the installment disappointing? Stacy: I was disappointed that it was so predictable. It was obvious both brothers would die and that the kid would get the organ. Amanda: I guess the two brothers dying was fairly obvious. I also wish I’d seen more aftermath of Owen and Amelia’s first time together. Mary Kate: I don’t know if I found anything disappointing. I guess, I wish there was more about Derek and Meredith or Owen and Amelia considering there were big developments last week for both couples. Christina: This episode was a letdown for me. From being predictable to falling flat, I was bored for the majority of it. 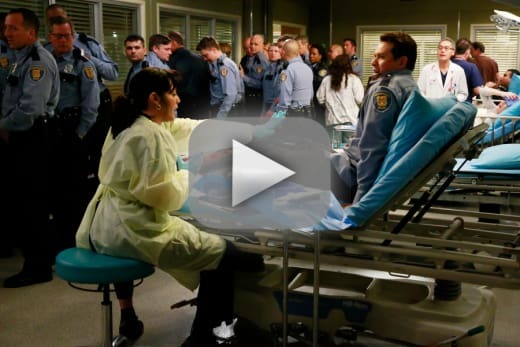 What did you think about the storyline with the mother losing both her sons who were cops? Stacy: It was sad. I felt for her, especially when she blew up at Bailey. It was nice that the other cop was able to talk to her and comfort her at the end. Amanda: Like I said above, it was a pretty predictable storyline. That being said, I felt bad for the mother. I was also annoyed at Bailey for being so blunt about asking for their organs for the shooter. Mary Kate: It was incredibly sad. I couldn’t help but tear up at the end when the cop cars escorted the brothers’ organs to the airports. So sweet. Bailey should’ve been a tad more respectful because it was obviously a sensitive topic. Christina: I couldn’t imagine being in the mother’s position and it was heartbreaking. Albeit predictable, the storyline showed how the death of two brothers could still help dozens of other people. 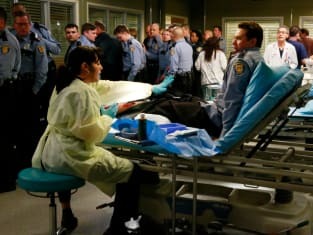 Callie hit it off with her patient. Should she take him up on his dinner offer? Stacy: Sure, why not? He was cute and it’s just dinner, what’s the harm? I want Callie to end up with Arizona eventually, but I think both of them need to date other people before they realize they belong together. Amanda: She definitely should. He was nice and cute. Callie deserves a good time, and the writers are clearly not putting her and Arizona back together anytime soon. Mary Kate: I’m all for it. They seemed to hit it off and the guy was so nice, Callie needs a good date. I love Arizona and Callie together, but after their break-up and how happy Callie has been since, I still deciding whether I want them to get back together or not. Christina: 4 for 4! Most definitely! Callie deserves to laugh and dance again. Amelia’s falling in love with Owen. React! Stacy: I think it’s too soon, especially for Owen. He and Cristina moved really fast and that didn’t work out so well, so I think it would be a good idea for them to take things slow. Amanda: When did this happen? While I’m enjoying seeing their relationship develop, it’s way too soon to be saying she’s in love with Owen. I definitely see long term potential, but they should take things slow. Mary Kate: I love the idea. They’ve both been through a lot in relationships, as a Private Practice fan, I’ve seen Amelia’s relationships. They obviously have a connection and while it may be too soon, I think their goals align more than Owen and Cristina’s did. Owen needs some sort of stable relationship. Christina: Initially, I thought things were happening way too fast for these two. However, just like in real life, some relationships take your breath away and you fall head over heels for someone before you can even catch your breath. Return next week for our take on Grey's Anatomy Season 11 Episode 19. Thanks for reading! Jo: You need to expand your horizons. Stephanie: My horizons haven't been expanded in a very long time. Permalink: My horizons haven't been expanded in a very long time. Bailey: Grey, look I had to try. Meredith: For your patient, I know, but now that's dozens of transplant patients that you just screwed out of a chance.